Note: Prospective homebuyer’s utilizing any City or State sponsored homeownership program offering primary mortgage loans and downpayment assistance must have completed the “Homestretch” first time homebuyer’s workshop before loan approval. Call the Minnesota Homeownership Center to find the nearest workshop location to you! Meet Twin Cities Habitat’s income guidelines and credit and occupancy standards (these are adjusted annually). Contact this State Agency if you are interested in a 30-year fixed FHA mortgage product for purchasing the home of your dreams anywhere in the State of Minnesota. MHA also has several different downpayment assistance programs available to qualified buyers. 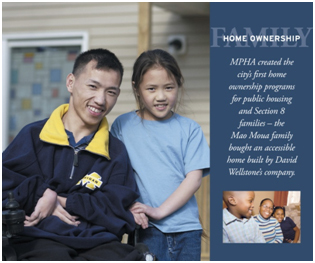 Call the MHA Homes Division to receive an information packet and a list of qualifying MHA lenders, or download current information and list of participating lenders. MHA participant lenders also administer the American Dream Downpayment Initiative (ADDI) down payment assistance program. The City of Minneapolis offers financing and two types of improvement loans through its City Living Program, a joint effort between the City of Minneapolis and the City of St. Paul. For more than 20 years the two cities have worked together to create mortgage loan products for low- and moderate-income families. Historically, CityLiving loans offer homebuyers an opportunity to purchase homes in Minneapolis at an interest rate that historically ranks below general market rates. Down payment assistance may also be available to eligible households. Call or visit the City’s web site and download program information, applications and the list of participating lenders. CLCLT assists first time homebuyers in providing down payment assistance for the purchase of homes in the City of Minneapolis. Potential homebuyers must meet income guidelines and qualify for the primary mortgage loan with a CLCLT participant lender. Homebuyer’s purchase the home and improvements, and enter into a long term land lease to sustain the affordability of the property. Upon sale of the home, there is an equity split between CLCLT and the homeowner, making the home perpetually affordable to lower income families. Call CLCLT at ext. 18 for more information. Powderhorn Residents Group Inc. partners with communities all over the Twin Cities to stem the tide of home foreclosures and mitigate the effects of vacant, foreclosed homes. They offer free foreclosure counseling, helping many clients stay in their homes and avoid foreclosure. PRG is certified to conduct First Time Homebuyer Training Education and Mortgage Readiness Counseling by the American Homeownership Education Counseling and Training Institute (AHECTI) and the Minnesota Homeownership Center to give first-time and first-generation homebuyers the knowledge and confidence to buy homes and be successful, long-term homeowners. The mission of Neighborhood Housing Services of Minneapolis is to renew pride, promote and revitalize inner-city neighborhoods through the efforts of local residents, acting in concert with public and private partnership; and by emphasizing safe, affordable housing through homeownership for low and moderate income individuals and families in under represented populations. The HousingRescource Centers offer Down payment assistance for home buyers in many Twin Cities communities as well as low cost financing to fix up your home, rental property or business to qualifying borrowers. OwnAHomeMN.org is a centralized, online resource for low to moderate income families who are exploring homeownership in the Twin Cities. Here, prospective homebuyers can find listings of affordable single family, condominium, and townhome ownership options constructed or rehabilitated by local non-profit developers. Unlike the MLS, OwnAHomeMN.org offers listings exclusively from locally based, non-profit housing developers. These organizations have committed to improving the communities where they work and their homes are built or rehabilitated to high standards. The website also contains a section on homeownership resources, including homebuyer assistance and affordable rehab or improvement programs, homeownership counseling and education, and foreclosure prevention offered by nonprofit and governmental partners.